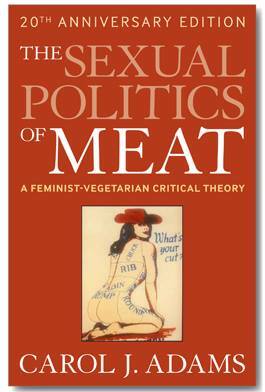 Join us for a discussion of Carol J. Adams’ The Sexual Politics of Meat. For a great overview of the book read What I Vegan’s book report on her blog. Buy the book here or email us to borrow a copy. Check out this amazing event hosted by many of our local animal rescue organizations! 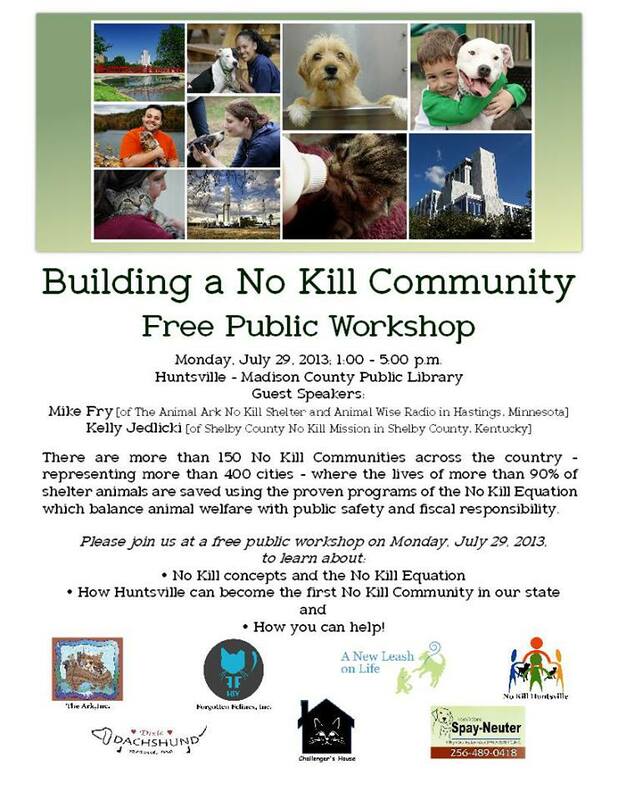 From their website: “No Kill Huntsville is a coalition of local animal welfare advocates and rescuers working together to help bring reform to our region toward helping Huntsville become the first No Kill Community in our state. 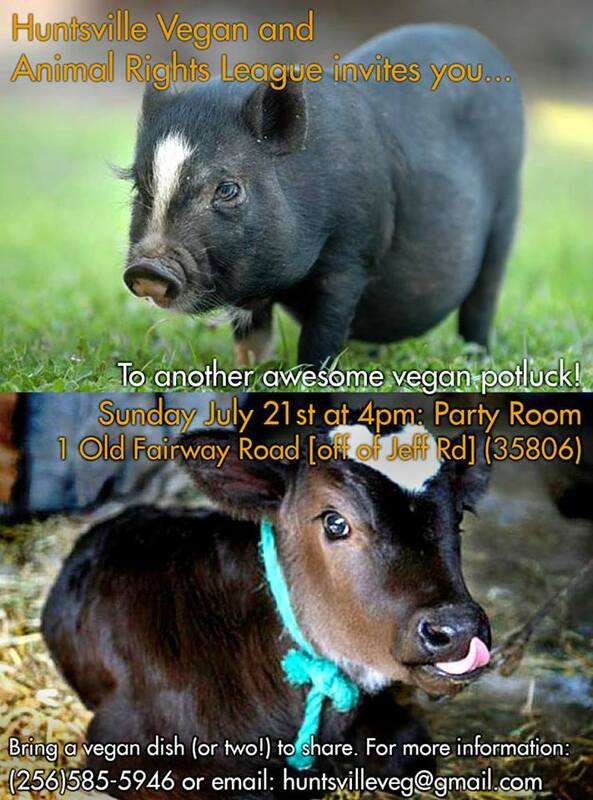 Huntsville Vegans 2 Year Anniversary Potluck! Bring your swimsuit!! The potluck will be in the “Cyber Café” party room connected to the apartment office & pool at the roundabout before the gates. Look for signs on the doors. If you see exercise equipment, you are close–it’s in the building next door. NOTE: Please prepare your food before coming to the potluck! If you need to heat up dishes, that’s totally cool. But *please* do your cooking (or as much as you can) before coming out. Thanks everyone! Basically, 1) bring some food! 2) If you’re not sure about something, ask the organizers/hosts. 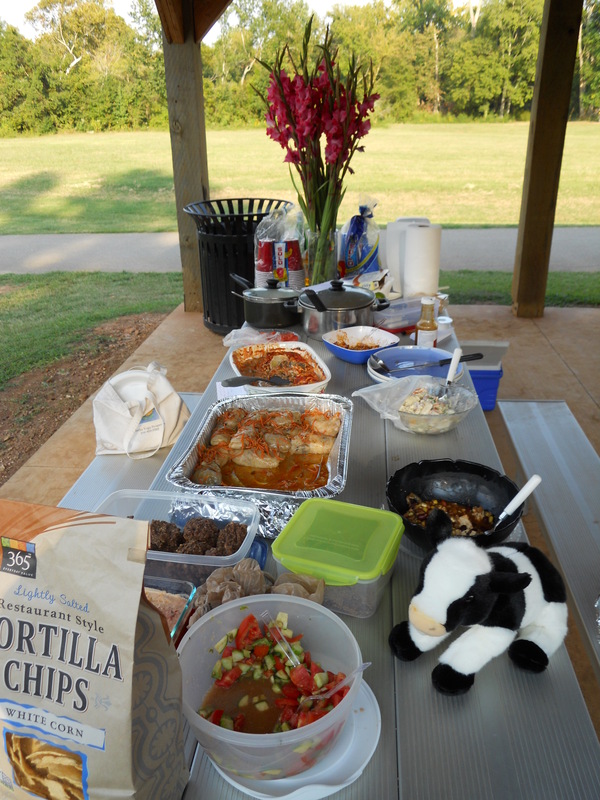 3) Be nice to whoever opens their home for the potluck, the public area that we’re using (clean up! ), and the people around us, and 4) HAVE FUN. PLEASE invite your friends. Help us promote this event! All of our potlucks have been wonderful, and though this one is coming up soon, I think it’ll be a good one as usual. Whatever anyone brings will be appreciated. If you are tired/poor/busy/etc. It’ll be okay if you come without bringing something, but it’s not a potluck if no one brings food! So we strongly urge you to bring a dish. If you’re not sure how much to bring, imagine that you’re making food to feed a dish to eight friends. If you bring more, that’s wonderful, but this should be a good guideline. Ready-made vegan food is available from Earth Fare and is always welcome if you run out of time to cook. Look for the part of the tag that says “Vegan” in the deli section, bakery, and on the hot bar. When terribly in doubt, fruit is always welcome and appreciated and beautiful. We’d prefer everyone to come at four, but if you can’t make it ’til five, so be it. Six? We’ll still be hanging out being awesome. If you can just stop by, meet everyone, see if there’s some food left (and hopefully there will be plenty) and run away, well, we’ll be happy to have met you. Please bring your recipe or an ingredient list with your dish. We’ll have utensils and other items handy just in case. Bring a musical instrument and we’ll have a rhythm jam (we mean it)! Organizer Mike and others will bring guitars and other instruments. please get it in on the jam We’ll bring a turkish hand-drum. Bring some others! Dogs (or any other non-human animal) are welcome, kids are welcome. If you have any questions about the potluck, or want to bring something but don’t know the first thing about vegan cooking, please message us on facebook or email us at huntsvilleveg@gmail.com. We look forward to meeting all of you! Huntsville Vegans will have a table set up at Earth Fare in Huntsville on Saturday February 23rd, 2013 from noon to 4pm. We’ll be distributing information, be available for questions, and will sample out some vegan goodies. We’ve got volunteer community opportunities available in the near-future in case you’d like to get involved, as well as numerous social events to take part in. Visit and find out what’s coming up. Our partner student group the UAH Veg Association will also have a presence at our able, sharing information and opportunities for Huntsville students. Our monthly movie nights take place on the second Thursday of each month at the Huntsville Public Library (in the auditorium on the ground floor) in Downtown Huntsville. Doors open at six, and we’ll start the movie itself around 6:30. This particular screening will probably go no later than 7:30, but everyone is welcome to hang out afterward until nine. 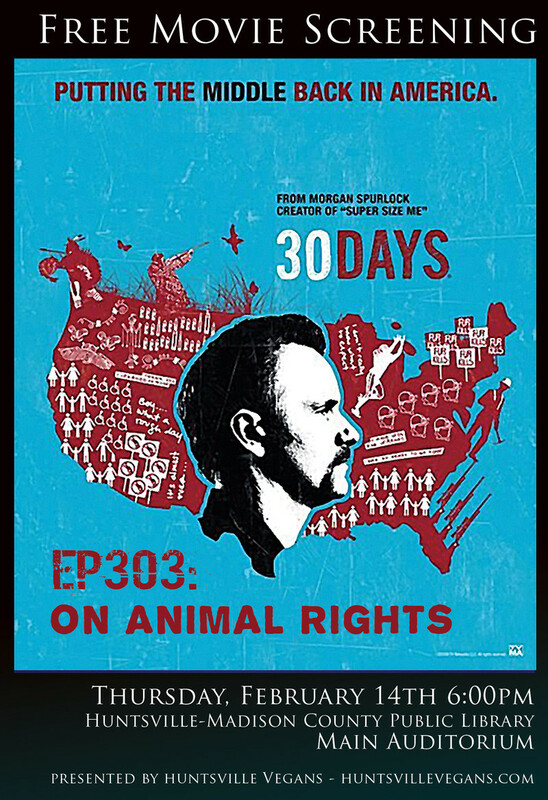 “From Academy Award nominee Morgan Spurlock (Super Size Me) comes 30 Days, a documentary series that will explore what life changing experiences are possible in 30 days. The concept for the show stemmed from the transformation Spurlock underwent when he ate nothing but fast food for 30 days in his documentary movie Super Size Me. In this FX series, Morgan Spurlock asks the question, what would happen if people spend 30 days living in someone else’s shoes? Find out the answer as he brings you 30 life changing days in one hour focusing on topics such as minimum wage, outsourcing, religion, sexual orientation, and jail. We’ll be sharing food at this event as well. Even though this program is presented by Huntsville Vegans, non-vegans are very welcome. That said, we ask that if you bring something to share that it be vegan. If you are not sure about something, please contact us! Ongoing 2013 screening dates coming soon!